Jordan Eberle scored twice and added two assists as the Edmonton Oilers beat the Calgary Flames 7-3 on Saturday to sweep the four-game season series for the first time. Eberle's wrist shot at 5:58 of the first period made it 3-0 for the visitors and prompted a goalie change as Flames coach Glen Gulutzan brought in Brian Elliott for Chad Johnson, who allowed three goals on four shots. 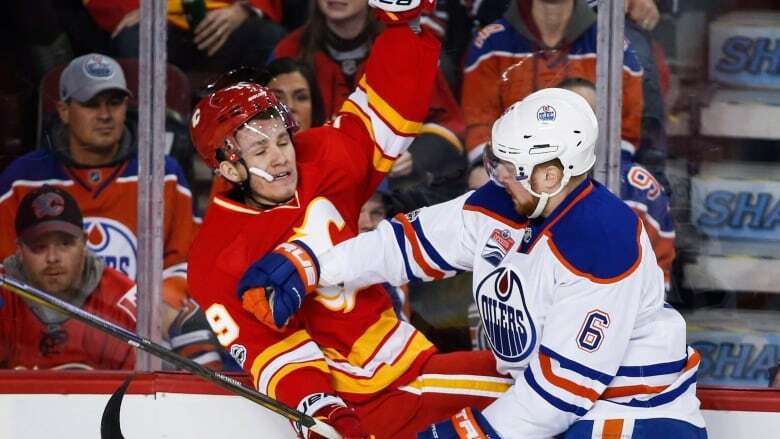 The Oilers continued to capitalize on Calgary mistakes in the second period. After Connor McDavid's power-play goal at 3:57, Eberle scored again at 12:24, making it 5-0 when he was left open in the slot to deflect in Matt Benning's pass. Anton Slepyshev, Mark Letestu, Oscar Klefbom and Ryan Nugent-Hopkins also scored for Edmonton (26-15-8). The streaking Oilers are 5-0-1 in their last six. Sean Monahan, extending his goal-scoring streak to five games, Matthew Tkachuk and Lance Bouma replied for Calgary (24-22-3). The Flames open up a three-game Eastern Canada road trip on Monday in Toronto.